The weekly Friday demonstration in Nabi Saleh, led by the local popular committee was dedicated to Jerusalem (al-Quds) and the political prisoners. Marchers commemorated two martyrs who were killed this week, 16 years old Muhammad Sinokrot from Jerusalem, and Raed Ja’bari, a political prisoner who was beaten and tortured to death in an Israeli jail. 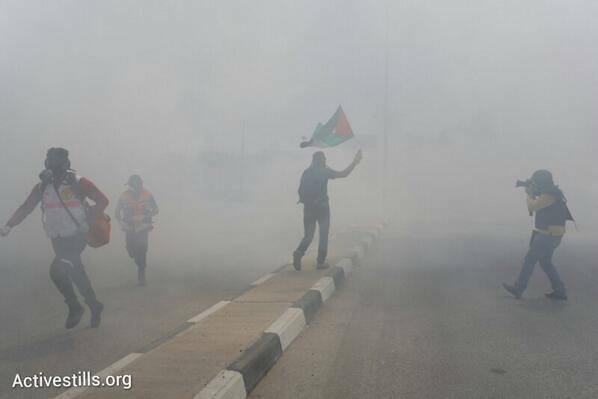 The IOF attempted to suppress the march using barrages of tear gas and rubber coated steel bullets. No serious injuries reported. Weekly Protests, Friday 30th August 2013 – full report for all districts click here. After the Friday Prayer, Palestinian, Israeli and international activists marched from the Martyrs’ square, in the center of the village, towards the confiscated land and natural spring near the Israeli illegal settlement of Halamish. Activists chanted slogans calling to the release of Palestinian prisoners and condemning the expansion of Israeli illegal settlements in occupied Palestine. 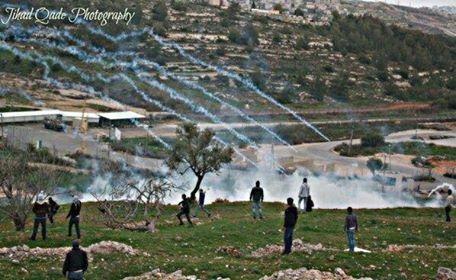 As the march reached Al shaheed Musatafa Tamimi street, Israeli Forces attempted to suppress the protest by firing tear gas and coated rubber bullets at peaceful demonstrators. Several people suffocated from teargas. After the Friday Prayers, dozens of Palestinian, Israeli and international activists marched towards the confiscated land near the Israeli military watch tower at the entrance of the village, chanting slogans calling for national unity and holding photos of prisoners and of Yasser Arafat. 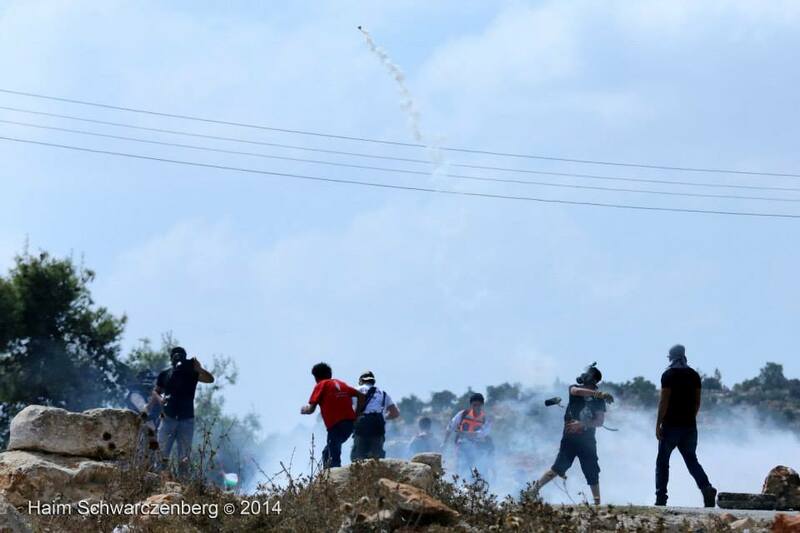 As on most Fridays, the Israeli Forces prevented the march by firing a massive amount of rubber bullets and tear gas canisters leading to many suffocations cases. 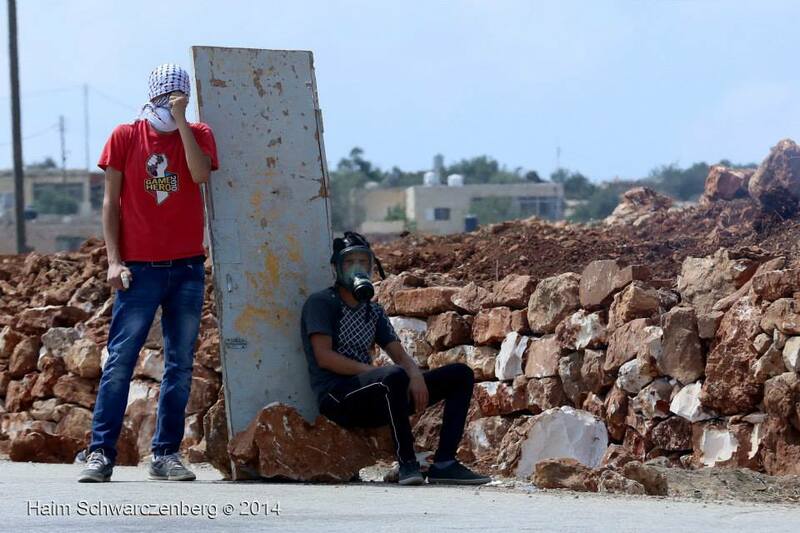 Clashes broke out; Israeli army invaded the village and targeted houses with their munitions. The Popular Struggle leaders reminded that national unity is essential to end the occupation and to establish a Palestinian state with Jerusalem as a capital. Nariman Tamimi (37) and Rana Hamadah (21) were arrested on 28 June 2013 in the village of Nabi Saleh in the occupied West Bank, when non-violently protesting Israel’s ongoing occupation. 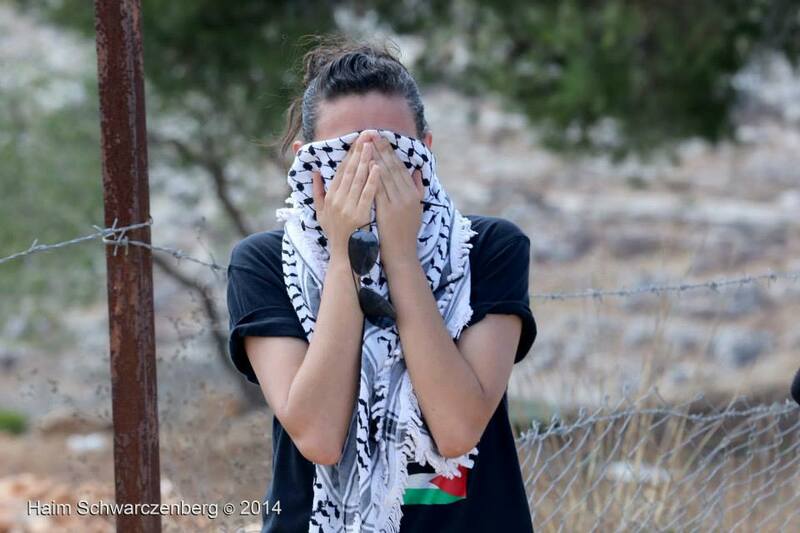 Nariman is a resident of Nabi Saleh and has been arrested 5 times for the leading role she has played in her village’s non-violent resistance to Israel’s occupation and the illegal annexing of village land by the illegal Israeli colony of Halamish. Nariman and Rana have been charged with violating “a closed military zone”, a military order which deemed Nariman’s village and land a military zone. Amnesty International and the Israeli human rights organisation, B’Tselem have noted that the arrest, charges and trial of both women are an attempt to prevent even non-violent protests against Israel’s occupation. Photo: Palestinian activist Nariman Tamimi (left) and Rana Hamadah waiting the verdict in Ramallah on July 9. Photo by Ahmad Gharabili via Maan News. OFER MILITARY COURT (AFP) — An Israeli military court formally charged two Palestinian women on Tuesday over their involvement in a peaceful demonstration in the West Bank last month. In a hearing at Ofer military court near Ramallah, Nariman Tamimi, 37, and Rana Hamadah, 21, who also holds Canadian nationality, were charged with “entering a closed military zone” during a demonstration in Nabi Saleh, where villagers have been protesting since 2009 over the seizure of their lands by a nearby settlement. 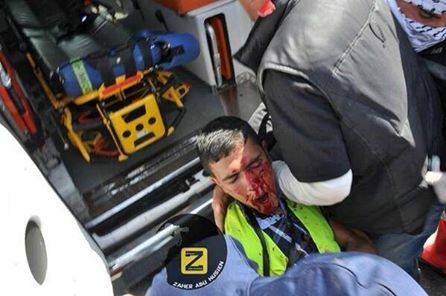 According to Israeli rights group B’Tselem, the two were part of a group of around 25 people who participated in a peaceful demonstration on June 28 which was stopped by a group of Israeli soldiers and border police as they crossed a field near the village. After a five minute standoff during which the forces informed them the area was a closed military zone, the group turned around and headed back towards the village, said B’Tselem’s Sarit Michaeli, who was videoing the protest. “A group of five or six of them were just walking back when suddenly they were stopped and three of them were arrested,” she said. The two women and a Spanish national were then driven around in the back of a jeep for most of the day, and taken to a police station around midnight. Security forces released the Spanish woman but drove the other two to HaSharon, where they were held until late on Monday night, Michaeli said. “This particular demonstration did not involve stone throwing,” she told AFP, explaining that despite the peaceful nature of the protest, the military prosecution initially asked for the two to be held until the end of legal proceedings in a step she described as “disproportionate”. The court rejected the request, but a judge ruled that Tamimi, a mother of four who is married to veteran Nabi Saleh activist Bassem Tamimi, would be placed under house arrest every Friday. She is next due in court on September 3. Hamadah, who is studying in Canada and is also facing obstruction charges after trying to prevent the forces from handcuffing her, was also barred from entering the village on a Friday. Her next hearing is on July 17. The arrest in 2011 of Tamimi’s husband on charges of organizing illegal gatherings and incitement sparked international condemnation with the European Union recognizing him as a human rights defender, and Amnesty International declaring him a prisoner of conscience. Almost all demonstrations in Palestine are defined as “illegal” under Israeli military law, which states that any gathering of 10 or more people requires a permit. 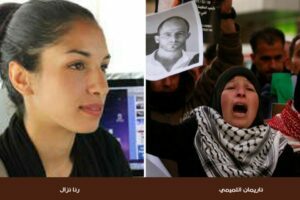 Tomorrow, Tuesday, 9 July 2013, the military court at Ofer Israeli military base will hold its first session in the trial of Nariman a-Tamimi and Rana Hamadah, who were arrested on 28 June 2013 during the weekly demonstration in the West Bank village of a-Nabi Saleh. 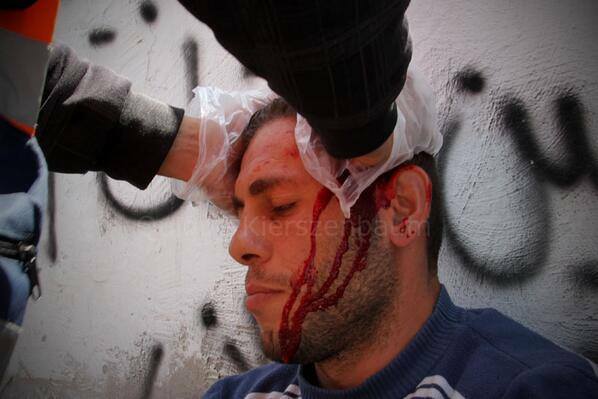 The demonstration was not violent and there was no stone-throwing. The two Palestinian women were held at Sharon Prison in Israel for almost four days, and were then indicted for entering a closed military zone. The military prosecution rarely issues indictments for this offense. Rana Hamadah was also charged with obstructing a soldier in the execution of his duty. A foreign national arrested along with the two was released that night and barred from entering the village of a-Nabi Saleh for 15 days. After serving the indictment, the military prosecution requested the court to remand the two women for the duration of the proceedings. Justice Maj. Shahar Greenberg denied the request, and instead ordered that the two remain under house arrest for the duration of the proceedings. Implementation of the order was delayed upon request by defense counsel Adv. Nery Ramati. President of the Military Appeals Court Col. Netanel Benisho is shortly to announce his ruling on an appeal filed in this case. The legal proceedings since a-Tamimi and Hamada were arrested are unprecedented, given the minor nature of the offense: the indictment does not claim that the two women acted violently. Furthermore, two military judges who watched video footage of the women’s arrest stated that they had found no evidence of violent or menacing behavior on their part. During the court sessions, Military Prosecutor Maj. Gilad Peretz even acknowledged that one reason for requesting continued remand was to keep the women from participating in demonstrations – unacceptable grounds that cannot possibly warrant detention. The fact that Judea and Samaria Attorney Lieut. Col. Maurice Hirsch himself represented the prosecution at one of the court sessions further demonstrates the military prosecution’s determination to keeping the two women behind bars. Nariman a-Tamimi is a prominent activist in the struggle that residents of a-Nabi Saleh village have waged over the last three years against the Israeli occupation and against being dispossessed of their land and water spring by settlers. Her husband, Bassem a-Tamimi, served 13 months in prison after being convicted by the Ofer military court of participating in illegal demonstrations and incitement to throw stones. In November 2012 he was sentenced to an additional four months of prison time, after being arrested at a demonstration near an Israeli supermarket chain in the West Bank. The European Union has declared a-Tamimi a human rights defender. Catherine Ashton, European Union High Representative of the Union for Foreign Affairs, voiced concern over a-Tamimi’s conviction, which was based on testimonies taken from two minors from the village, who were interrogated in violation of their rights. Nariman a-Tamimi’s brother, Rushdi, was killed by live ammunition fired by soldiers during clashes in the village in November 2012. A Military Police investigation into the circumstances of his killing is still under way. The couple has four children. 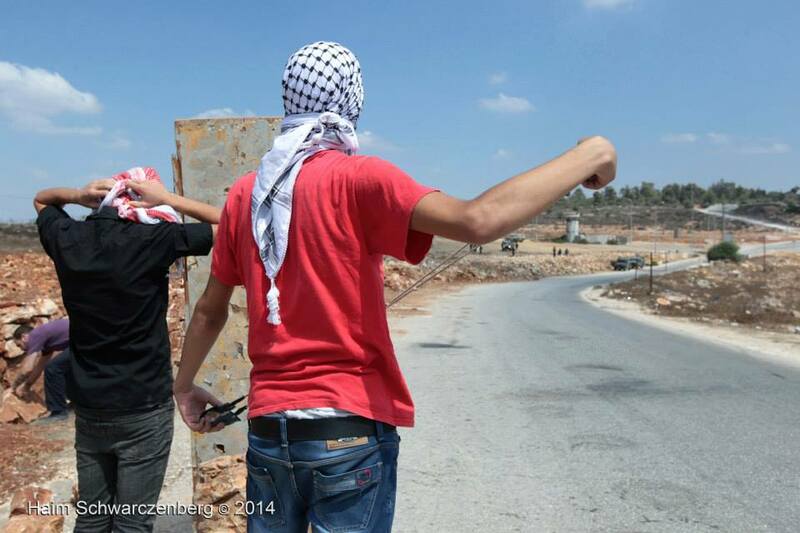 The demonstrations in a-Nabi Saleh began in December 2009 to protest the fact that settlers, apparently from the nearby settlement of Halamish, had taken over the al-Qus spring and other villager-owned lands. Israeli military and Border Police forces are stationed there to prevent the demonstrators from reaching the spring and an adjacent road, which is also used by the settlers, arguing that the demonstrators may throw stones at settlers. Often, security forces halt the demonstration before it has even left the village. 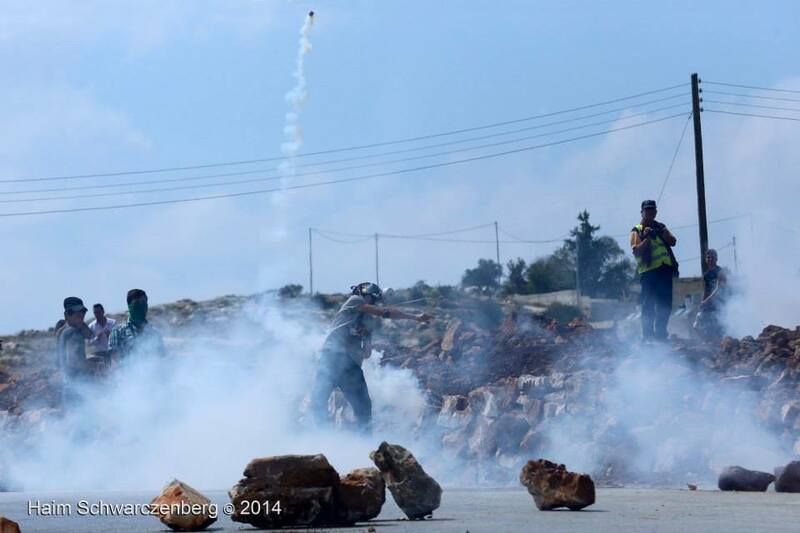 For the past three years, B’Tselem has been documenting the actions used to violently suppress the demonstrations in the village, even when demonstrators are not throwing stones. As part of this suppression, the military has been exploiting legal means such as issuing warrants declaring village lands a closed military zone on Fridays, for as long as half a year at a time, and prosecuting the organizers of the demonstrations. To date, indictments have been served only in cases of violence or incitement to violence. No such claim has been made in the case at hand. She related that “We met the 16 other Palestinian women political prisoners who welcomed us warmly. On Sunday they cooked mloukhieh & sent it to our cell. Lina Jarbouni and Alaa Joudeh I met when I was imprisoned last year. Lina has 6 years left on a 17 year sentence & Alaa was arrested at 17. “Lots of soldiers try to ease their consciences on us, perhaps by offering us water (wow) or telling us they don’t even like their job. It is much worse to me when a soldier knows what they’re doing is wrong but are too weak to stop doing it. I’m tired of weakness,” she wrote.